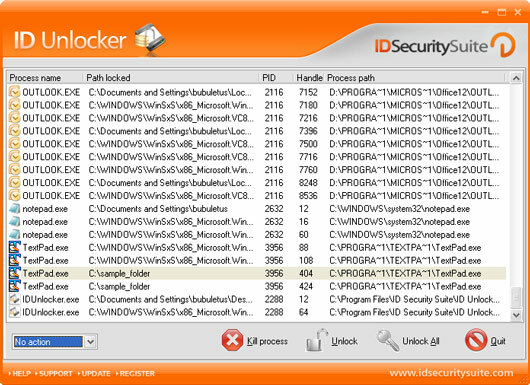 ID Unlocker is a handy utility which acts as an Explorer extension to help you unlock files. It gets rid of error accessing messages and error deleting files or folders and allows you to proceed with computer related actions. Main Features: - Unlocks inaccessible folders - Deletes files that can't normally be deleted - Erases and moves selected applications - Executes inaccessible programs - Kills processes at your request Detailed features: - Unlocks files that have an error executing. It allows you to see the content of a folder that shows an error executing message, such as:'The file is in use by another program or user', or 'The source or destination file may be in use'. - ID Unlocker has simply-to-use context menu with a command line which enables you to choose the action to take. It also provides a 'process and handlers list', letting you see the name and the path of the process and letting you close a handle if you desire. It gets rid of error accessing messages and error deleting files or folders and allows you to proceed with computer related actions. Main Features: - Unlocks inaccessible folders - Deletes files that can't normally be deleted - Erases and moves selected applications - Executes inaccessible programs - Kills processes at your request Detailed features: - Unlocks files that have an error executing. It allows you to see the content of a folder that shows an error executing message.